While I have many recipes that I tinker with, wife Jan has her own dishes with which to play. She really likes cranberry sauce, but she is still looking for the perfect recipe—sauce 1, sauce 2, sauce 3. She felt that sometimes adding ground spices left some of her sauces “gritty.” This Thanksgiving she decided to use a cocktail of spice/fruit flavored liqueurs. What is a Thanksgiving turkey without the sauce? Jan read recently that while many of the ingredients of an American Thanksgiving feast had a New World origin, the culinary aesthetic was definitely Old World. The serving a tart fruit sauce with greasy roasted meats comes straight from the (European) Middle Ages. Jan usually makes a cranberry Cumberland sauce for Thanksgiving. This year she thought she would mix it up. 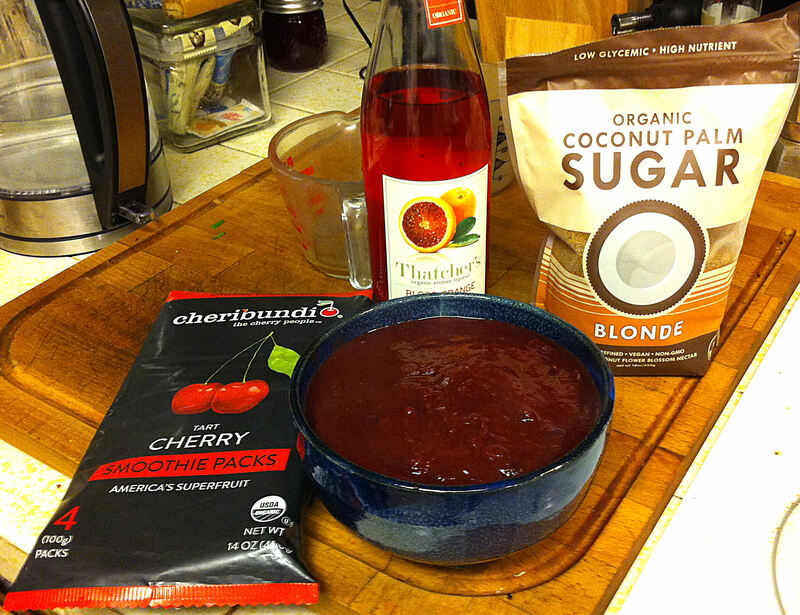 She had bought some frozen tart cherry juice for smoothies and she thought it would go well with the tart cranberries.